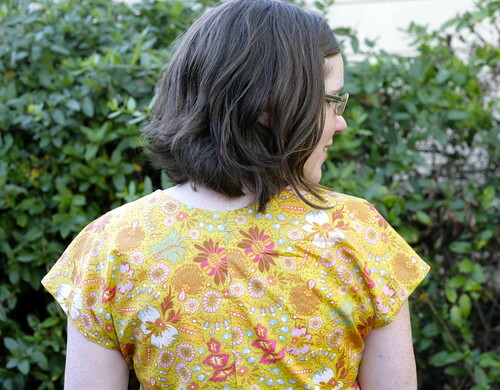 Inder Loves Folk Art: Selfish Sewing Week: The Bess Top. Whew. September has been busy! I am feeling behind at work and behind in my blogging. I have been sewing but there are several projects I haven't blogged yet. It seems like every time I sit down to blog my kids start screaming. And keep screaming until I abandon the blog post. Does anyone else have this problem? In theory, I could write posts after the kids go to bed, but (a) my kids never seem to go to bed; (b) if one magically goes to sleep on time, the other refuses to and wakes up the first one; and (c) by the time both kids are asleep, it's mama bedtime, and I am absolutely exhausted and could not string two brain cells together, let alone 500 words. So anyway, it took me a while to get on the "Selfish Sewing Week" bandwagon, but here I am, better late than never! 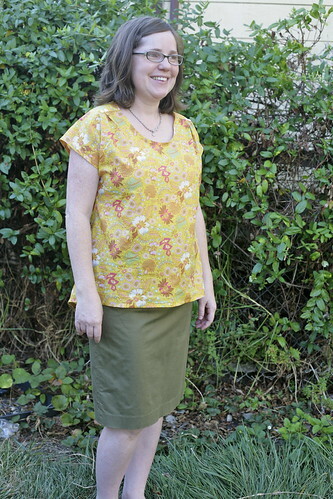 This is the "Bess Top" from Imagine Gnats. 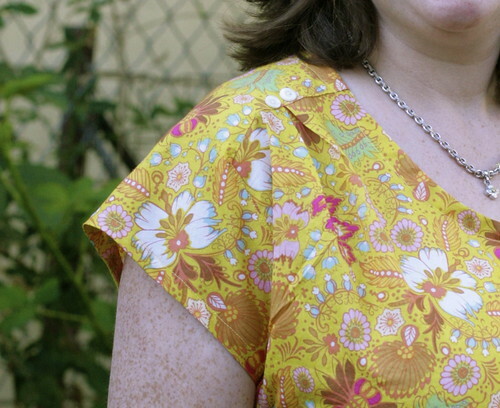 I was actually a tester for this pattern, and have already made up one version in striped linen shirting. Which I haven't blogged. Because I am so freaking behind. Because I can't blog, see above. Ah well. This version is in a voile from Anna Maria Horner's Little Folks line. This pattern is really simple and sweet. I love the way the shoulder wraps over the front. And the little pleat is perfect. Inspired by this version, I added two tiny little buttons to each shoulder pleat. Such a sweet idea! This fabric is like "budduh," people. So soft. And so gloriously yellow and cheerful! Not the easiest thing to sew, but lovely. I opted to face the neck, sleeves, and hem with self-bias. That's a whole lot of voile to cut, sew, and press (it resists pressing a bit), but the end results are so nice. To save fabric, I used a seam up the back, and used it to create a bit of additional shaping, too. 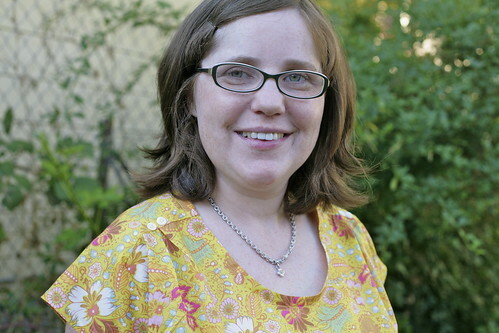 It has been really fun to see my friend Rachael at Imagine Gnats graduate from regular ol' sewing blogger to pattern designer! And her patterns are the bomb. She's livin' the dream, people! This is lovely Inder - I am addicted to voile - so nice to wear. I've got this pattern on my wish list! It isn't the easiest to sew, but it sure IS nice to wear! I agree! It's gorgeous! I think this is my fave version of this top I've seen so far. And your hair looks great :) By the way it is indeed a season in your life, and in about oh... five years... that is if you don't end up having any more kids, it will be partially over, haha! And the baby stage passes too fast. I know you're right. It's good and important but when it's over, you miss it. So lovely! And yes, my kids do that. I leave my laptop open on our kitchen bar so that I can walk by, write as much as possible, and be able to walk away without kids reaching the keys. Like I needs messing with my html! Those little pleats on the front are so lovely! I hadn't noticed them before! And I hear you on always feeling behind...that's the story of my life too nowadays. And for the record - I get NOTHING done once the kids are asleep because I'm asleep approximately five minutes later. I am too damn tired nowadays! Well, you have a job, kids, AND school, right? Lord. I am getting sleepy just thinking about it. Very lovely blouse! Looks awesome! You are not alone! We get those with Joe, in addition to the baby stuff with Maggie. Yawn. inder - it's always funny how different things look on my tiny iphone screen where i read your posts on the weekends through feedly and on the big computer screen when i come to comment. first i want to say i love your hair. it is so cute! does your hair have natural body or do you have to style it like that? it's amazing. but i'm also wondering - did you decide to grow out your bangs? 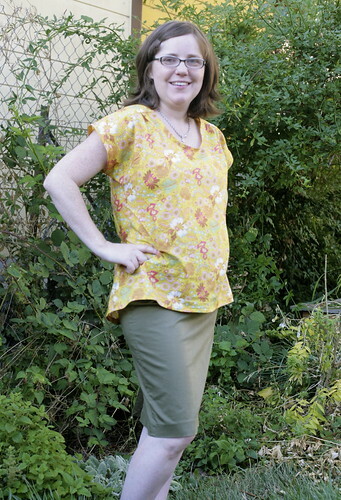 the top is very cute and i am inspired by how much you sew for yourself. wow! it's really amazing. your result are always so professional. the colors in the top really bring out the color in your eyes. are they green? so pretty! I love the colors and print of this top! And I completely understand about blogging. My brain stops working at 9:00 and so I don't trust myself to blog or sew after that time! So I always hope the kids take good naps so I can enjoy some sewing and blogging! You look fantastic! I love those shoulder pleats.